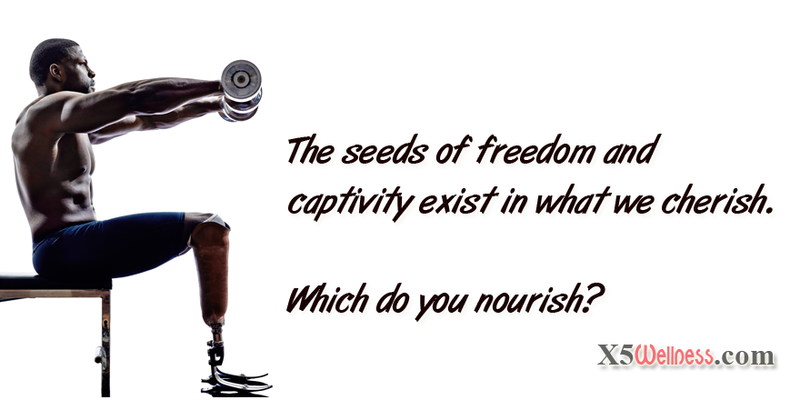 The seeds of freedom and captivity exist in what we cherish. Which do you nourish? Those who value freedom and goals recognize binding thoughts, feelings or actions. They choose consciously those thoughts, feelings, and action that enhance freedom and assist them in reaching an ever-expanding circle of goals. They continuously resist and let go of what could bind them. I have been fortunate enough to know those who value unconditional love beyond freedom. Out of love, they are willing to give up their freedom to help others gain and express theirs. Those trained in and guided by unconditional love are not fools even though their selfless acts may appear foolish. They are not naive even though their purity of action may seem naive. They are not impatient even though their lack of support for self-indulgence disguised as expressions of freedom may appear impatient. A goal by definition is something we have not reached. Binding thoughts, feelings, and actions by definition imprison us within what we have achieved. One of the most effective ways I know to make progress toward specific goals is to study those who have truly mastered those goals and then modify our behavior to match theirs. Behavior pattern of those who have accomplished a goal is different than those who have not. The greater the difference the greater the struggle to make the switch especially if we judge their behavior through the lens of our binding thoughts, feelings, and actions. Expect some degree of eustress in the process. Do not confuse the positive eustress with negative distress. Learn to embrace eustress and release distress.